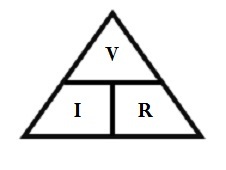 Any two known quantities of V, I and R are enough and the OHM's Law will be used to calculate the unknown quantity. To calculate the Voltage, please enter the values of Current I and the Resistance R. The multiplication of these I and R produces the resulting Voltage. To calculate the current, just provide the values of Voltage V and Resistance R. The Voltage V divided by the Resistance R produce the resulting Current I. To calculate Resistance R, please provide the values of Voltage V and Current I. The Voltage V divided by the Current I produces the resulting resistance value R.